Tower flux measurements of carbon dioxide, water vapor, heat, and meteorological variables were obtained at the Tapajos National Forest, km 83 site, Santarem, Para, Brazil. For the period June 29, 2000 through March 11, 2004, 30-minute averaged and calculated quantities of fluxes of momentum, heat, water vapor, and carbon dioxide, storage of carbon dioxide in the air column, are reported. Data are reported in three comma separated files: (1) 30 minute-averages, (2) the daily (24 hour) averages, and (3) the monthly (calendar) averages. The variables measured on the 67 m tower relate to meteorology, soil moisture, respiration, fluxes of momentum, heat, water vapor, and carbon dioxide, and were used to calculate storage of carbon dioxide, Net Ecosystem Exchange, and Gross Primary Productivity. Most of the variables have not been gap filled. However, CO2 flux and storage have been filled to avoid biases in Net Ecosystem Exchange; a fill index flag is included to indicate which data points were filled. Variables derived from the filled variables (respiration, NEE, GPP) are essentially filled also. Net ecosystem exchange has been filtered for calm nighttime periods. This data set was archived in October of 2009. Users who download the data between October 2009 and September 2014 must comply with the LBA Data and Publication Policy. Over 3.5 years of 30-minute averaged measured and calculated quantities were compiled at the km 83 tower site (June 29, 2000-March 11, 2004). The variables relate to meteorology, soil moisture, fluxes of momentum, heat, water vapor, and carbon dioxide, including the storage of carbon dioxide in the air column beneath the flux sensors. Data are presented as values measured or calculated at 30 minute intervals as well as calculated daily (24 hour) and monthly (calendar) means. There are 64992 records (rows), each corresponding to a 30 minute interval for a total 1354 days beginning June 29, 2000 and ending March 11, 2004. The timestamp corresponds to the beginning of the 30 minute interval. The first timestamp is experiment day 181, or June 29, 2000, where experiment day counts from 0 at 00:00 hours on January 1, 2000. The last timestamp is day 1535, or March 11, 2004, the day that a tree fell on the tower. There are 1354 records (rows), each corresponding to a daily (24 hour) average of the 30 minute values. There are 44 records (rows), each corresponding to a monthly (calendar) average of the daily values. Months with some missing days were excluded. The experimental day for monthly average was set as a day near the end of the month. Fields are included that report the number of days used to calculate the various quantities. For the storage flux, molar densities of CO2 and H2O in the profile were determined using an IRGA. The amount of CO2 stored beneath the eddy flux sensors (64 m) was calculated by integrating the profile between 0 and 64 m. The storage flux was then calculated by differentiating this quantity with respect to time. Net ecosystem exchange (NEE) was calculated for each half-hour interval as the sum of the turbulent CO2 flux at 64 m and the change in the amount of CO2 in the air column beneath 64 m (the storage flux). Ecosystem respiration was calculated from nighttime measurements of NEE during periods with sufficient vertical mixing; i.e., friction velocity ms-1 [Miller et al., 2004]. The necessary -threshold at this site was determined by comparing flux tower estimates of with several independent lines of evidence (scaled-up estimates of respiration components [Chambers et al., 2004b], and radon-based estimates of nocturnal mixing [Martens et al., 2004]. Uncertainties in the calculation of respiration and NEE at the Tapajos sites are discussed in detail in Saleska et al. and Miller et al. . Gross primary productivity was calculated by subtracting NEE from ecosystem respiration. Continuous 30-minute GPP were averaged to construct daily and monthly estimates of GPP. Uncertainty in monthly and annual GPP was calculated as the 95% confidence interval based on averaging daily GPP. An additional estimate of respiration (R) was calculated as the intercept (PAR=0) of a non-linear least squares fit of a light curve model, NEE = R + (A*PAR)./(PAR+B), using measured PAR and NEE (when PAR>0 umol/m2/s and u*>0.22 m/s) , and A and B and R are the regression constants. For each day, the light model was applied to all available data within 20 days, thus a 40 day window. Missing flux intervals in the yearly record were filled differently depending up on the length of the data gap and whether the gap was biased towards certain meteorological conditions. All gaps in NEE shorter than 2 hours were filled using linear interpolation. Longer gaps that were not considered biased to certain meteorological conditions were filled using mean diurnal variation (Falge et al. 2001). We used 20 days of reliable data nearest the missing interval to fill the gap. Missing intervals due to window obstruction of the open-path IRGA were distributed unevenly over the day. Daytime gaps were biased towards cloudy conditions and to account for that these gaps in NEE were filled using a light-curve model based on this data set. Analysis of eddy covariance observations provides information useful for identifying which physiological and physical processes play dominant roles in controlling CO2 exchange. In turn, this information contributes to the development and improvement of models of ecosystem- atmosphere CO2 exchange and to understanding which processes are particularly sensitive to future change. Missing values or data that were flagged as unreliable either by an objective algorithm or subjective inspection have been given a value of -999. It is up to the end-user to fill these values if necessary. Separate columns are included for CO2 flux, storage, NEE, and GPP that indicate that the value was measured/calculated, or filled. These columns can be used by the end-user to substitute their own filling strategy. Flux measurements were made from a 67 m tall tower, additional measurements were made on two 2 m tripods installed on the forest floor. The data acquisition computer and closed-path gas analyzers were located in an air-conditioned hut 8 m south of the tower base. Data acquisition and control systems were automated and data were downloaded weekly. Five data loggers connected by a coaxial network collected the instrument data in two types of files: slow files with 30 min statistics and fast files with 4- or 0.5 Hz observations which was then stored on the data acquisition computer. The turbulent fluxes of sensible heat, latent heat, CO2, and momentum at 64 m were determined with the eddy covariance technique. The signals directly required for flux calculation were digitized and stored at 4 Hz. Wind and temperature were measured with a 3-axis sonic anemometer pointed due east (Campbell Scientific, Logan UT). Winds from the east predominate at 64 m, accounting for about 85% of day and night intervals. The molar densities of CO2 and H2O at 64 m were measured with two independent InfraRed Gas Analyzers (IRGAs). The first measurement was made by drawing 20 to 24 standard liter min-1 (slpm) of air through a closed-path IRGA (LI-COR LI7000 or, before Dec. 2000, a LI 6262, Lincoln NE) in the instrument hut. Air was drawn through a coarse polyethylene screen inlet 50 cm above the sonic anemometer, down a 9.5-mm-inner-diameter 75-m-long Teflon PFA tube, and through a 1 micron pore 142 mm diameter Teflon filter. The sample tube was encased in an insulated heating bundle that maintained its entire length at 65oC (Unitherm 2256, Cape Coral FL) to prevent condensation and reduce water vapor exchange with the wall. The pressure in the IRGA cell was actively controlled at 85 kPa (MKS Instruments, Andover MA). The IRGA reference cell was flushed with 1 slpm of CO2 and H2O free air from a purge air generator (Matheson GEN PGW 28 LC, Montgomeryville, PA). The IRGA was calibrated daily at 2300 local time by sequentially sampling purge air, CO2 standard in air (+-1% Scott Marin, Riverside CA), CO2 free air (Scott Marin, Riverside CA), and room air drawn through a thermoelectrically cooled condensing column at 16o C (LI-COR LI610, Lincoln NE). The LI-7000 absorbances were recorded and the gains, zeros, instrument non-linearity, temperature, pressure and effects of water vapor accounted for in subsequent processing. An independent measurement of CO2 and H2O at 64 m was made with an open path IRGA (LI-COR LI7500, Lincoln NE) positioned 40-cm south of the sonic anemometer. The open path was calibrated by comparison with the simultaneous measurements made with the closed-path eddy covariance IRGA. The open path IRGA CO2 and H2O signals were corrected for the simultaneous fluctuations in air density using two approaches: applying the ideal gas law to the individual 4 Hz observations using the humidity-corrected sonic temperature, and applying the corrections to the 30-minute statistics. The CO2 fluxes for both the open and closed path IRGAs were calculated as the 30-minute covariance of the vertical wind velocity (w) and the CO2 mixing ratio after subtracting the 30-minute mean (c'). The time lag for the closed path IRGA (typically 11 s) was determined by maximizing the correlation between w and c'. The fluxes were rotated to the plane with no mean vertical or cross wind. A third IRGA (LI-COR LI7000 or, before Dec. 2000, a LI800, Lincoln NE) sequentially measured the molar densities of CO2 and H2O at 12 altitudes (0.1, 0.35, 0.7, 1.4, 3, 6, 10.7, 20, 35, 40, 50, 64 m above the ground) every 48 minutes. Four slpm of air was drawn through a 2 micron filter at each altitude, down 5.5-mm inner-diameter polyethylene lined tubing (Furon Dekabon 1300), through a solenoid manifold in an enclosure at the base of the tower (Parker General Valve, Fairfield NJ), into the equipment hut, and through the IRGA cell. The pressure in the IRGA cell was actively controlled at 83 kPa (MKS Instruments, Andover MA). The IRGA was calibrated for CO2 and water vapor daily by sequentially sampling purge air, CO2 standard in air (+-1% Scott Marin, Riverside CA), CO2 free air (Scott Marin, Riverside CA), and 16o C dew point air (LI-COR LI610, Lincoln NE). Delft, The Netherlands). Air temperatures at 64, 40, 10 and 2 m heights were measured with ventilated thermistors (model 076B, Met One). Horizontal wind speeds at 64, 50, and 40 m height were measured with cup anemometers (model 014; Met One). Soil temperatures at 19 locations at depths of 0.02 to 0.25 m were measured with copper constantan thermocouples (Omega Engineering) and soil heat flux at 2 cm depths was measured with 5 flux plates (REBS HFT3.1). Soil moisture at depths between 0.1 and 2.5 m across 20 locations was measured with water content reflectometers (Campbell Scientific CS615). Litter moisture was measured using 6 fuel moisture probes position immediately above the forest floor. Soil respiration was measured beginning in August 2001 with 15 automated chambers (Goulden and Crill 1997) located in intact forest approximately 50 m east of the tower and 50 m from the nearest logging-created gap. These chambers were sampled sequentially at 12 min intervals and soil respiration calculated from the increase in chamber CO2 concentrations over the sampling period. Goulden M.L, and P.M. Crill. 1997. Automated measurements of CO2 exchange at the moss surface of a black spruce forest. Tree Physiology 17: 537-542. Saleska S.R., S.D. Miller, D.M. Matross, M.L. Goulden, S.C. Wofsy, .HR. da Rocha, P.B. de Camargo, P. Crill, B.C. Daube, H.C. de Freitas, L. Hutyra, M. Keller, V. Kirchhoff, M.. Menton, J.W. Munger, E.H. Pyle, A.H. Rice, H. Silva . 2003. Carbon in amazon forests: Unexpected seasonal fluxes and disturbance-induced losses. Science 302:1554-1557. Miller, S.D., M.L. Goulden, M.C. Menton, H.R. da Rocha, H.C. de Freitas, A.M.E.S. Figueira, and C.A.D. de Sousa. 2004. 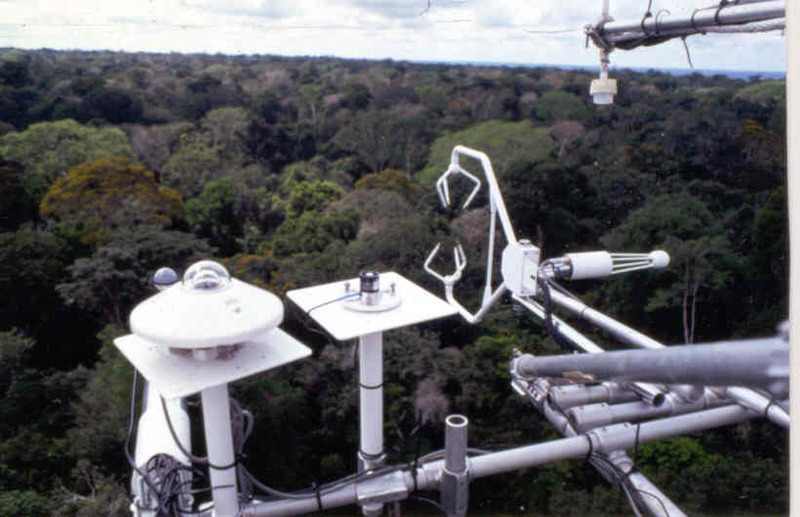 Biometric and micrometeorological measurements of tropical forest carbon balance. Ecological Applications 14(4):S114. da Rocha, H.R., M.L. Goulden, S.D. Miller, M.C. Menton, L.D.V.O. Pinto, H.C. de Freitas, and A.M.E.S. Figueira. 2004. Seasonality of water and heat fluxes over a tropical forest in eastern Amazonia. Ecological Applications 14(4):S22-32. Doughty, C.E., M.L. Goulden, S.D. Miller, and H.R. da Rocha. 2006. Circadian rhythms constrain leaf and canopy gas exchange in an Amazonian forest. Geophysical Research Letters 33(15): L15404, doi:10.1029/2006GG026750. Goulden, M.L., S.D. Miller, and H.R. da Rocha. 2006. Nocturnal cold air drainage and pooling in a tropical forest. Journal of Geophysical Research-Atmospheres 111(D8):D08S04, doi: 10.1029/2005JD006037. Bruno, R.D., H.R. da Rocha, H.C. de Freitas, M.L. Goulden, and S.D. Miller. 2006. Soil moisture dynamics in an eastern Amazonian tropical forest. Hydrological Processes 20(12):2477-2489. Miller, S.D., M.L. Goulden, and H.R. da Rocha. 2007. The effect of canopy gaps on subcanopy ventilation and scalar fluxes in a tropical forest. Agricultural and Forest Meteorology 142(1):25-34.